​Will Trump accept the results of the 2020 election if he loses? Will Trump Accept the Results of the 2020 Election if He Loses? The president's speech before the National Republican Congressional Committee was equal parts terrifying and nonsensical. President Trump seems confident he's going to be re-elected in 2020. He also seems prepared to challenge the results should a Democrat unseat him. 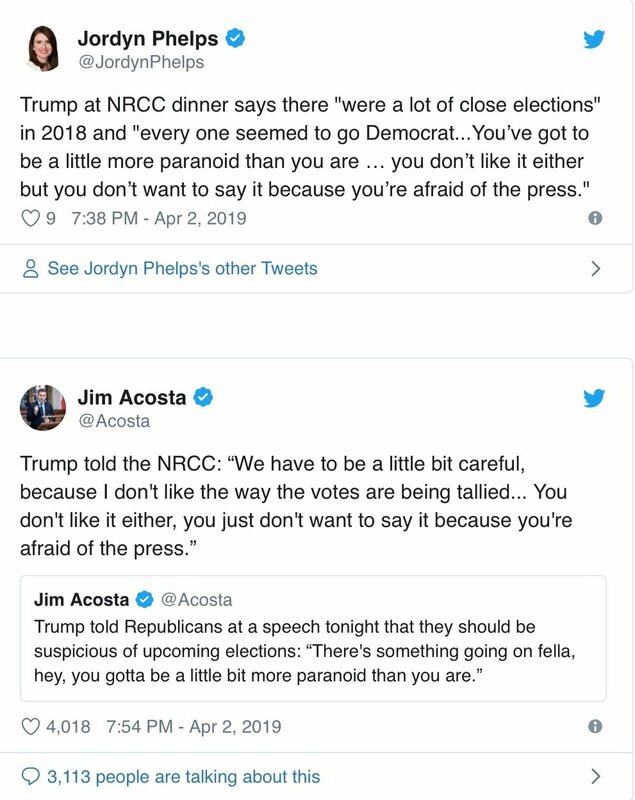 While speaking Tuesday night at a National Republican Congressional Committee fundraiser, the president implied that the 2018 midterm elections were rigged in favor of Democrats, who won control of the House of Representatives overwhelmingly, and that the 2020 election results could also be illegitimate should Republicans fail to prevail. "We have to be a little bit careful, because I don't like the way the votes are being tallied," Trump said. "You don't like it either, you just don't want to say it because you're afraid of the press." Trump has long indicated he might not be content to pack up his bags and skip out of the White House were he to lose the 2020 election. Despite possessing no evidence, the president has claimed millions of people voted illegally in the 2016 election, and that Democrats were literally busing people across state lines so they could vote multiple times. Trump's claims of voter fraud were likely an exercise to protect his ego after having lost the popular vote to Hillary Clinton, and they will almost certainly be renewed — and with far more vigor — should he lose next year. As Michael Cohen — who understands how Trump's mind works possibly better than anyone — said during his testimony before the House Oversight Committee last month, "I fear that if he loses the election in 2020, that there will never be a peaceful transition of power." Tuesday night, when he wasn't calling America's electoral process into question, Trump was delighting the crowd of GOP donors by attacking several leading Democratic figures, including Joe Biden. "We're going into the war with some socialist," he said of the 2020 election. "It looks like the only non-sort of-heavy socialist is being taken care of pretty well by the socialists. They got to him. Our former vice president. I was going to call him, I don't know him well, I was going to say, 'Welcome to the world, Joe. You having a good time, Joe? Are you having a good time?'" Trump was likely referring to the recent criticism of Biden's handsy approach to politics. Four women have come forward in the past week to say that Biden made them feel uncomfortable by touching or kissing them in an inappropriate way. Trump also joked about Rep. Alexandria Ocasio-Cortez (D-NY), who he disparaged as a "young bartender, 29 years old," drawing huge laughs, and Sen. Mazie Hirono (D-HI), who he claimed, falsely, wants to build a train to Hawaii because the Green New Deal would eliminate air travel, which also is not true. 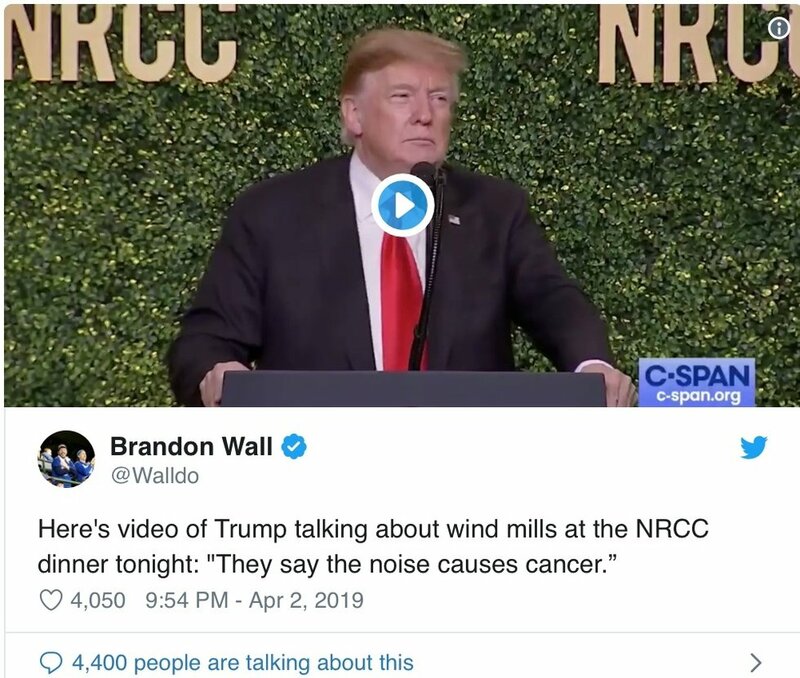 The president also continued his crusade against wind power, a bizarre issue that he's brought up multiple times in the past week. "Hillary wanted to put up wind," the president said. "Wind. If you have a windmill anywhere near your house, congratulations, your house just went down 75 percent in value. And they say the noise causes cancer. You tell me that one [makes windmill sound effect, mimics rotor motion with hand]. And of course it's like a graveyard for birds. If you love birds you'd never want to walk under a windmill." The tone of the speech was lighthearted, and almost all of Trump's jabs drew huge laughs from the crowd of Republican big wigs. At one point, Trump lamented that an attendee was probably going to end up leaking his off-color comments. "Someone's going to leak this whole damn speech to the media," he said. The event was broadcast live on CSPAN. Voices4america Post Script. Yesterday, he was asking again and again, if anyone knew the “oranges" of the Mueller investigation. Today, he was talking about illegal votes and windmills causing cancer.Is this the behavior of a man fit for the presidency? Jennifer Rubin of the Washington Post has answered this - Trump is unraveling before our eyes. He isn't fit for reelection.